Kook Soon Dang Co., Ltd.
Dong Jin Medical Co., Ltd.
Hyundai special feed IND Co., Ltd.
Dong Hai Engineering Co., Ltd.
Gangwon-Do, with the best wind power resources in Korea, has highly advantageous condition in developing the Province into wind power generation hub in Korea. Good accessibility that connects to major cities in Northeast Asia within 2 hours distance by plane. Geothermal and wind power as two major regenerative energy sources in Gangwon-Do. Regenerative energy of Gangwon-Do has increased from the current 2.86% of total energy consumption to 10.19% in ten years. Gangwon-Do has core infrastructure such as expressways, railroads and ports perfectly connect the metropolitan regions and the nation. With our powerful search tools and marketing solutions, Kompass can help you better understand your marketplace and to generate leads as well as promote your company online towards a targeted audience. 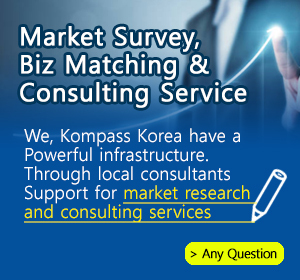 Find out the detail information about South Korean companies in Gangwon-do which is registered in the Kompass B2B worldwide database.